I have added numbers to the various Walter Palks in this account. The first Walter names his 'cousin' Walter , son of Thomas Palke deceased, in his will. From Charles Worthy's 'Devon Parishes': 'Walter Palke was buried at Ashburton in 1679, and he is the first I find mentioned in connection with this parish. He appears to have had a brother Thomas and a sister Dionysia, who married Townsend, to her he leaves £10 by his will, dated 5th November 1677, and proved in the Peculiar Court of the Dean and Chapter of Exeter, 19th December 1679, and of which the following is an extract. 5th November, 1677 - Walter Palke of the towne of Ashburton, yeoman. To my sister Dionis Townsend, £10, and her life in all my lands lying in Ashburton, after the death of my wife Agnes. To my cousin Margaret, daughter of Dionis Townsend, Joan and John Townsend, £10 to the first and 50s each to the two last. To my cousin Walter, the son of Thomas Palke, deceased, reversion of the lands aforesaid, charged with 20s a year to my cousin Dionis; residue to Agnes my wife, who is sole executrix. Witnesses: Thomas Palke, Agnes, William and Mary Hannaford. Proved 19th December, 1679. 'The agreement of marriage between Stephen Townsend of this pish and Dewnes Palke daug of Dewnes Palke widowe, also of this pish, was delivered unto the Register the 5th day Ap 1656, and published three Lord's Daies following. Walter Palke , yeoman, was buried at Ashburton 9th November 1679, affidavit made by Thomasin Robins jnr., witnessed by Agnis Palke and Joan Rowe. Walter Palke , son of Thomas Palke deceased. 'The will of this Walter is dated February 22nd, 1705; he describes himself as Walter Palk senr. of Ashburton, and leaves to Walter "Paulk my eldest son, all my lands after the decease of his mother", charged with the following payments, £40 to Jonathan my second son, £30 to Thomas my third son, £30 to Grace Palke my daughter. Residue to Grace my wife who is sole executrix. Witnesses: John Smerdon, John Furseman, Robert Jerman. Proved, Peculiar Court, Dean and Chapter, Exeter, 22nd May, 1707. Personal estate £160 10s 5½d. A Walter Palke, possibly Walter , was baptised at Ashburton 27th May 1660, the son of Thomas. Walter Palk  born 1714 had a son Jonathan who became Vicar of Ilsington, and wrote*, ' "My father [Walter Palk 4] was a little farmer with a large family; for him my uncle bought an estate which enabled him to live a credit to his brother and respected by his neighbours...He was of Headborough and Yolland Hill, the latter property being also in Ashburton parish...He married when twenty years of age at St Martin's Church, Exeter, Thomasine Withecombe of Priestaford, another farm close to Ashburton, and in his marriage licence he is described as of "Ashburton, clothier"...He married secondly, Mary Mugford, who died in May, 1793, he himself surviving until 1801. Walter Palk  married Mary Mugford 13th June 1749, at Ashburton. Walter Palk  the elder was buried on October 14th, 1801, at Ashburton. Settlement of lands at Widecombe in the Moor, dated 1801, names Thomas Palk of the City of Bath, one of the sons of Walter Palk late of Ashburton, decd. and Walter Palk of Marley House, together with William Fabyan of Ashburton, sergemaker; James Mogridge of Ashburton, surgeon; and David Bristow Baker of Newtington Butts, Surrey. Frances Palk married William Fabyan at Ashburton 21st March 1774. Walter Palk  married Elizabeth Lyde by licence at Ashburton 18th February 1782. Robert Palk Welland was the officiating minister. *It is not clear where the Rev Jonathan Palk's account finishes and Charles Worthy's resumes. Another relative claims that Robert was the son of Robert Palk and an Indian woman. The brother of Sir Robert was Walter Palk , 1714-1801. (see above). He had 4 sons, at least two of whom, Robert and Thomas, went to India at some stage. Robert, born 1744, allegedly died on the way home from India. Robert was born circa 1781 (calculated from age at death). Some websites claim that he was born in Varanesi, Uttar Pradesh, India. Robert Palk Esq., of the parish of Ashburton, married Mary Carrington at Ide on the 29th April 1812. The marriage was by licence. Robert Palk, born in November 1813 and baptised the following October. His father's occupation is given as Magistrate. In the 1841 census Robert and Mary are living at Lower Bowdley. Robert, whose profession is described as Independent, is 60, and Mary is 48. Robert was not born in the county. By this time Mary jnr. has married Thomas Smerdon, and Robert jun. has married Jane Smerdon. The Smerdons are brother and sister, both from Brownshill in the parish. The marriages took place in November 1838, apparently two days apart, although the witnesses are identical. The gravestone of Robert Palk and one of his children, in St Andrew's graveyard. 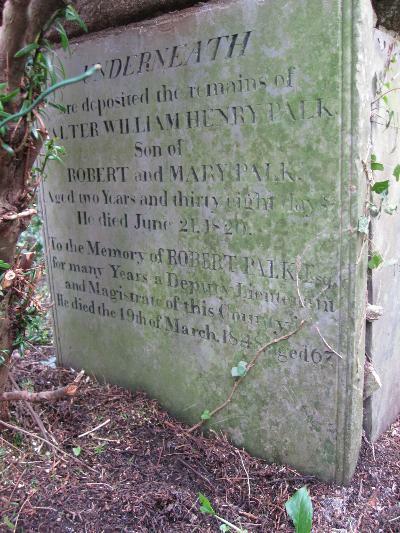 'Underneath are deposited the remains of Walter William Henry Palk son of Robert and Mary Palk. Aged two years and thirty eight days. He died June 21 1820. Mary Palk died in June 1868, in Emerald Hill, Melbourne, Australia. She was described as the relict of the late Robert Palk Esq., JP, Ashburton, Devon, England. See below for why Mary was in Australia. In December 1839 Robert Palk jun. of Ashburton put himself forward as a candidate for Superintendent for the proposed County and District Police force. He said that his father had been an active Magistrate for about 20 years. Robert Palk, 27, 'Ind', is living at Waverley Cottage in the 1841 census. Mary Jane Palk's birth was registered in the Newton Abbot district in the March quarter of 1840 - her mother's maiden name was Smerdon. She was baptized in March, the daughter of Robert and Jane. Robert was a yeoman, and the family lived at Bowdley, near Ashburton. Elizabeth Vaughan Palk's birth was registered in the Newton Abbot district in the March quarter of 1844 - her mother's maiden name was Smerdon. She was baptized in January 1844, the daughter of Robert and Jane. The family's abode was Bowdley, near Ashburton. Cammilla Carrington Palk, the four year old daughter of Robert Palk jun. Esq., died in March 1846. She was his second daughter*. In December of the following year Robert*, the son of Robert Palk jun. Esq., died at the house of his grandfather, in Ashburton. He was two years old. Eliza Camilla Carrington Palk, the daughter of Robert and Jane, was baptized in March 1848. Her father was described as a Gentleman. Frances Flora Palk's birth was registered in the Newton Abbot district in the December quarter of 1849 - her mother's maiden name was Smerdon. She was baptized in November, the daughter of Robert and Jane. Robert's profession was given as Gentleman. Frances Flora Palk was buried in August 1850. She was ten months old. Another Robert Palk, whose birth was registered in the Newton Abbot district in the December quarter of 1851, also had a mother whose maiden surname was Smerdon. He was baptized in August 1852, the son of Robert and Jane. Robert's profession was given as Gentleman. In the 1851 census Jane Palk, the wife of a tin and copper mining agent, is living in East Street. Children with her are Mary J, 11; Elizabeth H B, 7 and Eliza C C, 3. Her 60 year old mother-in-law Mary is also in the household. According to the website History of homeopathy in Australia Robert and his family (including his widowed mother Mary) arrived in Melbourne, Australia, in 1852. He seems to have become a mineral surveyor, but by 1854 was calling himself 'Doctor'. In 1857 he was listed in Tanners Directory of Melbourne as Robert Palk MD (homeopathic), by which time the family were living in the Melbourne suburb of Emerald Hill. Robert became very active in the community, being on various committees, in addition to being a magistrate and a JP. In 1862 Robert returned to England, leaving behind his wife, children and mother. After his wife Jane died, Emerald Hill Burrough Council voted that £10 be given to the children, who were in distress because of the death of their mother and the desertion of their father. In England Robert opened a homeopathic chemist at Henley-Upon-Thames. He remarried in 1866, to Jane Hilton Syme, but then bigamously married Anne Sophia Helmore. Robert and Anne emigrated to South Africa, where Anne had been born - Robert died at Potchefstroom in 1890. Melbourne 1859. In the Emerald Hill section of Tanner's Trade Directory under the heading Medical is Palk, R., MD, in Coventry St.
Melbourne. In 1862 four councillors were to be elected for the Emerald Hill Municipality. One of the seats had been that of Robert Palk, and was vacant 'in consequence of absence'. Robert Palk and Jane H Syme were married in the June quarter of 1866, in the Hackney registration district. Robert Palk and Anne Sophia Helmore were married in the September quarter of 1877, in the Pancras registration district.